Royal wedding T-shirts are coming to Asda & you'll definitely want one | HELLO! April 10, 2018 - 19:27 BST Leanne Bayley Asda's Royal wedding T-shirts come in either black or white, and they both have different slogans. 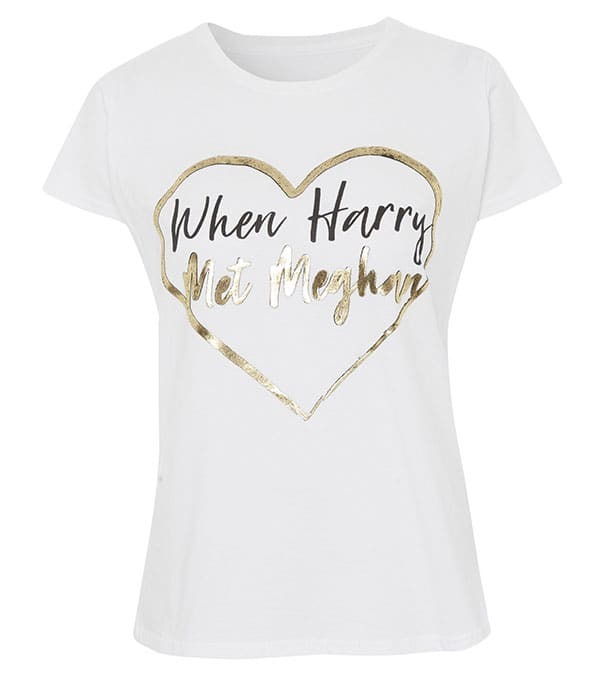 Will you choose the black tee which reads: ‘Marry me Harry’ or will you opt for white, which is emblazoned with ‘When Harry met Meghan’. Team HELLO! are gearing up for the biggest day of the year – the day Prince Harry weds his beautiful bride, Meghan Markle. Yes, we can’t wait. We’re going to pop open Prosecco, we’re going to eat cake, we’re going to cry tears of joy and we’re going to do a LOT of work. Yep, a glass of fizz will definitely be needed once we’re done. But while we’re slogging away getting all the inside gossip, we’re going to dress to impress, Yep, we’ll be wearing Asda’s awesome new royal wedding T-shirts - and at £4, you know they’re going to fly off the shelves. The two tees come in either black or white, and they both have different slogans. Will you choose the black tee which reads: ‘Marry me Harry’ or will you opt for white, which is emblazoned with ‘When Harry met Meghan’. It’s almost as cheesy as the Lifetime movie which is coming out a week before the wedding - honestly, if you haven’t watched the trailer, you really need to. But everyone loves a bit of cheese when it comes to romance, don't they? RELATED: What will be Meghan’s new name and title after the royal wedding? The tees will be dropping into store on 30 April and will be the perfect addition to your wardrobe on royal wedding day. Whether you’ll be watching in the pub or holding your very own street party, everyone will be obsessed with what you’re wearing. And yes, they’ll probably be worn to bed in the days afterwards, but it’s still a fun piece to wear, and at £4 the cute tee won’t break the bank. MORE: Absolutely everything you need to know about the royal wedding! Enough about what we're wearing though, what is Meghan going to wear? Speculation is rife with Meghan’s dress choice. Will she go with Ralph and Russo, Erdem or Henry Holland’s personal favourite, Burberry? Only time will tell.